This an excerpt from an interview with Tony Goodlette, which appeared in the October Eagle Peak Quarterly. Tony is reluctant to take credit for successes that his contributions in government and the private sector have generated. With some difficulty, we pried them out of him. It’s September 21, the day I arrived in South Vietnam. Fifty years ago today. 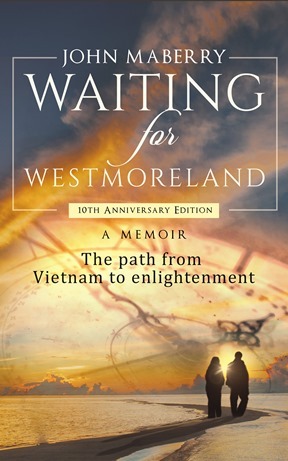 Ten years ago, on September 7, I published Waiting for Westmoreland. That memoir provides an explanation of how the loss of innocence and the shattered illusions I experienced put me on a quest. A quest that wound up providing me the tools to tend my garden, as Candide did by the end of Voltaire’s famous book. But that’s a post for another day. In a wonderful coincidence of sorts, Ken Burns 18-hour Vietnam War series began showing on PBS this week. I don’t know if those of you in other countries around the world will have ready access to it or not, but it’s well worth watching. Today, I’ll offer a glimpse of my arrival and first night in Vietnam. Next month I’ll have an extended feature on these anniversaries, the book and more in the October Eagle Peak Quarterly. In the meantime, I’ll be offering excerpts from the book on John Maberry’s Writing. So if you haven’t yet subscribed to John Maberry’s Writing, now’s the time. I don’t use a hated popup but you’ll easily find the subscription box on the sidebar. Later this fall, I’ll publish a slightly revised and updated tenth anniversary edition of Waiting for Westmoreland with a foreword, a preface and some snippets from a sequel of sorts to be published in 2019. On the ground at last, after the long flight from Guam, the plane taxied past sandbag-clad heavy steel revetments surrounding bombers and fighters on three sides. As we rolled to a stop, the flight attendant popped the door, allowing the cool cabin air to escape. Tropical heat—asphalt-softening, frying eggs on a sidewalk heat—washed in like a sunny surf, carrying unfamiliar smells. It was Saigon in late September 1967. A throng of cheering khaki-clad soldiers in loose formation waved and beckoned to us from the tarmac at Tan Son Nhut. They laughed and shouted as kids on a playground, all the while looking about as secret service agents do during a presidential walk on a crowded street. A year later, I would better understand their uneasy excitement. Barring a last-minute attack, they had survived their year in Vietnam. They would fly back to “the world” in the plane we exited. Wasting no time assembling here, we went straight from the ramp onto a prison bus. At least it looked like one. The kind of bus that hauls convict work gangs around some places in America, guarded by shotgun-shouldered Bubbas in Smokey hats. Only we weren’t the criminals. The bars and mesh covering the windows were there to protect us. How odd, I thought, we were here to protect the Vietnamese but we must be protected from them. Yet, on the busy streets we traveled, other military personnel walked freely about or rode in jeeps while Vietnamese civilians sped about on mopeds and bicycles. Other locals fearlessly shopped at the colorful stalls crowding sidewalks along the narrow streets. It was the first of many incongruities, in a year filled with them. Wealth and poverty, filth and beauty fought for my attention along the 16-mile route to Long Binh for in-country processing. Shacks of wooden ammo crates topped by rusty tin roofs stood next to trash-strewn alleys plied by scavenging birds and occasional cats. Nearby, women emerged from stone buildings of faded grandeur, wearing brightly hued pastel ao dais, snug from neck to waist but billowing in the breeze over their black silk pants. People of all ages carried huge loads on bent backs—bags from the market, bundles of straw or wood. Nearing a river away from the city, workers with conical straw hats strapped under their chins and pants rolled to their knees waded in muddy rice paddies. Further on, we passed the lush green of a rubber plantation, its opulent mansion only slightly tarnished by this or previous wars. I don’t remember at all, the afternoon arrival at Long Binh. So much of military existence is filled with an unremitting and unremarkable sameness. Hurry up and wait. “Assemble in a column of twos. Close it up ‘til your buddy smiles!” I do remember that first night in-country bunked under the cover of a circus-sized tent. Intermittently throughout the night, bright flares fell from the sky on parachutes, illuminating the nearby countryside as they swung to and fro. Muffled sounds of rifle fire, far away artillery and other ordnance unfamiliar to my ears rumbled through my head. Adrenaline-fueled wariness overcame weariness, shorting my sleep. Later, I would learn there was no fighting nearby and the flares were just routine. On the first night, however, fear filled me with dread. Did the anti-war protests of the sixties and seventies hasten the end of the Vietnam War? In retrospect, probably not. They most certainly helped bring an end to the political career of Lyndon Johnson and bring on Richard Nixon as the next president in 1968. 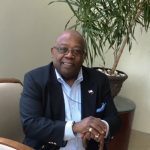 But I could hardly fail to participate in those protests, knowing what I did from spending the year between October 1967 and October 1968 in Vietnam . Did Rosa Parks bring Lyndon Johnson to confront the American South and shepherd the passage through Congress of the Civil Rights Act of 1964 and the Voting Rights Act of 1965? Not directly or by herself, but she started a parade of protests by countless others when she refused to move to the back of the bus in 1955. In the end, all of the protests did make a difference. Will the “I Can’t Breathe” protests have similar result—eliminating the impunity with which police officers can kill unarmed suspects? Who can say for sure, but the protests must continue. In 1849, Henry David Thoreau was imprisoned for refusing to pay a poll tax. While jailed, his friend Ralph Waldo Emerson visited him. He asked Thoreau, “Henry, what are you doing in there?” To which Thoreau replied, “Waldo, the question is what are you doing out there?” Thoreau in his civil disobedience (a published treatise) inspired Gandhi, who in turn inspired Martin Luther King. Nonviolent protest has a rich tradition in America. When an injustice occurs repeatedly, protests may be the one of the most effective tools at the citizen’s disposal, along with the ballot box, in generating a change. I have been putting a lot of effort into attracting interest through social media this spring, in preparation for recommencing serious writing. A cross-country move, a new home, a daughter’s wedding and other events kept me occupied for years longer than I wished after publishing Waiting for Westmoreland and the essay in TODAY. The essay is here, on Views from Eagle Peak, in the form of a static page, but in commemoration of the renewed push to write, here is that essay in the form of a post. Reprinted courtesy of TODAY at Minnesota State, May 2008 edition. For many years listening to classic rock, watching movies made by fellow boomers or reading their books, I sometimes felt pangs of regret. I had missed realizing my own creative potential. Why couldn’t I have been like Crosby, Stills and Nash? They were a commercial success and spokespersons of sorts for antiwar sentiments that I held dear. Why could I not have been at least as much a literary success as Donald Fagen was a musical success? Fagen, my unimpressive classmate from South Brunswick High School in New Jersey, had gone on to found and co-lead the very successful Steely Dan. For years, I felt somehow cheated by the politicians who’d engineered the war in Vietnam and by the generals who had conducted it. Their actions had forever altered my college and career trajectory. Since the second grade, when I received my first rejection slip from Scholastic, I cherished the goal of being a writer. I expected college to provide me with the tools of the writing trade, essential for fulfilling my childhood dream. Not only that, college would lead me to that all-important day job, providing food and shelter to otherwise starving authors.